Most kids would probably tell you that learning fractions is not that fun. If you remember anything from learning fractions, you probably don’t remember it being fun, either. But that doesn’t have to be the case. 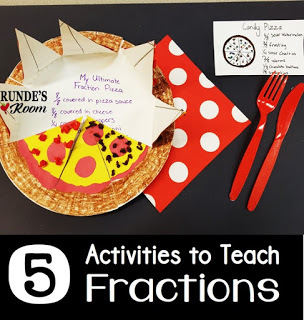 There are a lot of great teachers out there who make all aspects of learning more fun by learning through playful activities, like these activities for learning fractions from Runde’s Room. The stations one includes ideas for different games and activities that can be done in centers or stations, such as using dominoes and finding the least common denominator for the chosen numbers. These ideas look like a lot more fun than whatever we did when I was learning fractions in school. Do you have any fraction-related activities you like? I’d love to hear about them.